The player controls a snake-like ship moving around a number of mazes chasing three similar computer controlled ships. Being hit by bullets reduces the length of the ships. Ships are destroyed either when their length is reduced to zero or when they collide with a longer ship. Points are only awarded for shooting the oppossing players and collecting the occasional fruit bonuses. Fruit bonuses also increase the overall length of your ship. Collisions between ships do not award any point score. The computer controlled ships appear to have no chase or avoidance algorithms. They move around the maze making random turns. Each maze features a number of dead ends that will capture the computer controlled ships and the player has only a limited amount of time to destroy them before they self destruct (depriving you of the point bonuses for shooting them). The ships accellerate as their overall length decreases. 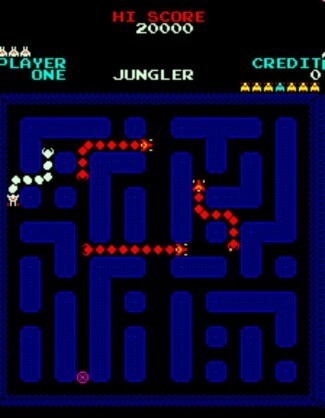 It is often necessary to use the features of the mazes to take short-cuts to catch a faster opponent, especially as they effectively accelerate away from you as you shoot them.